A new video has hit the internet showing an extraordinary and rarely seen sea creature deep in the Gulf of Mexico. The oarfish video originally recorded in 2011, was recently released in conjunction with an explanation of the creature which appeared in the June issue of the Journal of Fish Biology. Referred to as the “sea serpent,” the oarfish (Regalecus glesne) is an elusive serpentine fish that can grow up to 56 feet in length (the one captured in the video is about 8 feet long). It feeds mainly on krill and small crustaceans and lives in temperate to tropical oceans. The oarfish is a creature which seems straight out of science fiction, with an eel-like iridescent elongated body and a lengthy dorsal fin that spans roughly half of its body. To add to its eerie otherworldliness it orients this long tubular body vertically in the water with its head facing upward. Despite its size, the oarfish moves with great ease as it lithely undulates its dorsal fin like a propeller as it traverses the water. Normally a slow, stealthy swimmer, the oarfish has the ability to change direction in an instant when necessary. 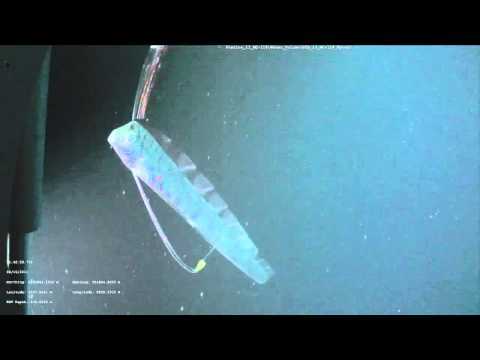 The oarfish captured in this footage is about 8 feet long and is at a depth of about 200 feet below the surface of the water in the Gulf of Mexico. It was recorded by Louisiana State University marine biologist Mark Benfield with the help of a remotely operated vehicle (ROV). ROVs are commonly used for such deep-water exploration, but their availability to researchers is limited. Because oil offshore oil companies have their own ROVs which are easier to negotiate time to use them, Benfield has been working with oil companies in the Gulf on a project called GulfSERPENT. The project is part scanning the water for marine life and part of the on-going efforts to assess the impact of the Deepwater Horizon oil spill of 2010. The news of capturing such an elusive creature is certainly exciting and a boost to Benfield’s research, but it is also a sobering realization of what little we know about our planet’s ocean life and how we could be harming still undiscovered life, especially with an event like Deepwater Horizon; the effects of which we may not fully realize for years to come. In fact, the oarfish itself could be suffering from the die-off of microscopic organisms called foraminifera (a form of zooplankton) that resulted from the spill and which are a key food source for the very krill they rely on for sustenance. Read more about the fallout of the Gulf Oil disaster.